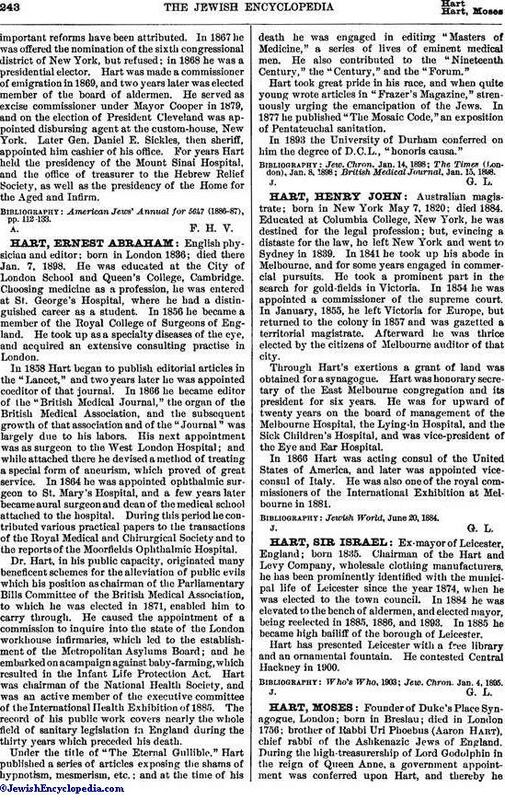 English physician and editor; born in London 1836; died there Jan. 7, 1898. He was educated at the City of London School and Queen's College, Cambridge. Choosing medicine as a profession, he was entered at St. George's Hospital, where he had a distinguished career as a student. In 1856 he became a member of the Royal College of Surgeons of England. He took up as a specialty diseases of the eye, and acquired an extensive consulting practise in London. In 1858 Hart began to publish editorial articles in the "Lancet," and two years later he was appointed coeditor of that journal. In 1866 he became editor of the "British Medical Journal," the organ of the British Medical Association, and the subsequent growth of that association and of the "Journal" was largely due to his labors. His next appointment was as surgeon to the West London Hospital; and while attached there he devised a method of treating a special form of aneurism, which proved of great service. In 1864 he was appointed ophthalmic surgeon to St. Mary's Hospital, and a few years later became aural surgeon and dean of the medical school attached to the hospital. During this period he contributed various practical papers to the transactions of the Royal Medical and Chirurgical Society and to the reports of the Moorfields Ophthalmic Hospital. Dr. Hart, in his public capacity, originated many beneficent schemes for the alleviation of public evils which his position as chairman of the Parliamentary Bills Committee of the British Medical Association, to which he was elected in 1871, enabled him to carry through. He caused the appointment of a commission to inquire into the state of the London workhouse infirmaries, which led to the establishment of the Metropolitan Asylums Board; and he embarked on acampaign against baby-farming, which resulted in the Infant Life Protection Act. Hart was chairman of the National Health Society, and was an active member of the executive committee of the International Health Exhibition of 1885. The record of his public work covers nearly the whole field of sanitary legislation in England during the thirty years which preceded his death. Under the title of "The Eternal Gullible," Hart published a series of articles exposing the shams of hypnotism, mesmerism, etc. ; and at the time of his death he was engaged in editing "Masters of Medicine," a series of lives of eminent medical men. He also contributed to the "Nineteenth Century," the "Century," and the "Forum." Hart took great pride in his race, and when quite young wrote articles in "Frazer's Magazine," strenuously urging the emancipation of the Jews. In 1877 he published "The Mosaic Code," an exposition of Pentateuchal sanitation. In 1893 the University of Durham conferred on him the degree of D.C.L., "honoris causa." British Medical Journal, Jan. 15, 1898.